1. Cut a hole in the small paper plate. 2. Roll a piece of orange construction paper into a cone and tape to secure. To test the length, insert it into the hole in the paper plate and trim off any excess that is hanging out too far. Put some glue around the hole and insert the "carrot" again. 3. Staple or glue your two plates together. 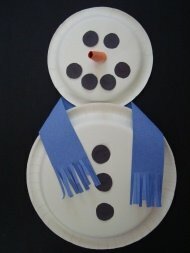 Cut and glue on some small black circles to make your snowmans' eyes, mouth and buttons. 4. Cut a long strip of paper for your scarf, and fringe the ends. Wrap it around your snowmans' neck and glue. You can add more to your snowman, try a black hat made from construction paper, or decorate your scarf with crayons or chalk, use real buttons if you have them, tape on two real twigs for arms, just be creative and use your imagination!